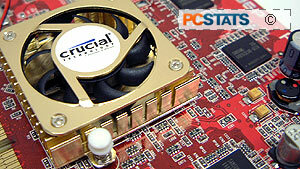 Because the 9600 Pro core is built on 0.13 micron manufacturing, Crucial can use a smaller (and quieter) heatsink. The card has 128MB of KD263228E-GC2A Samsung DDR memory, the same stuff that's found on the Radeon 9700 Pro/9800 Pro class videocards! Running at 300 MHz, the memory does not require any additional cooling. On a side note for those of you with older PC's, the Crucial Radeon 9600 Pro will not work with 2x AGP motherboards. Customer service is something you don't need till you're in trouble! I find it very curious that customer service is often something that most people overlook when purchasing goods.... then when something goes wrong, they're very willing to complain about it. When I hear someone complaining about a now-dead product, my response is always; "well it was cheap right?" As with everything else in life, you get what you pay for. While the Crucial Radeon 9600 Pro is not the best value card on the block, it's got some of the best customer care in the industry backing it up. You don't build up a 9.75 ResellerRatings (with over 700 reviews!) because you're lucky! From my personal dealings with Crucial, if I've ever have a problem with one of their products they go the extra mile to make sure the problems are fixed. If you have doubts, simply go to your favorite tech forum and ask about Crucial's customer service. I didn't really know what to expect from the Crucial Radeon 9600 Pro in terms of overclocking, given that we have seen wildly different responses from the Radeon 9600 Pro chip.... In any case, I started with a core overclock. I immediately raised the clock speed of the core to 500 MHz (9600XT speeds) and the card didn't have any problems - good so far. However, in the end I think temperature may have been holding the core back as the maximum core speed it reached was 506 MHz. The card uses 2.8ns Samsung DRAM, which is the same stuff that's found on Radeon 9700 Pro/Radeon 9800 Pro cards. In theory the memory should be able to reach at least 357 MHz, but whether the memory could reach that on this card was another question. Unfortunately we didn't have much luck with memory overclock. Even when I was being gentle, it max'd out at 315 MHz.